Fans are eagerly waiting for the Kalank trailer to release which is due tomorrow (April 3) but before the trailer, Alia Bhatt has dropped her sizzling hot pictures from her latest photoshoot. In the pictures, the 26-year-old actress is seen donning dazzling outfits. In one of the pictures, she is seen wearing a metal pink saree teamed up with wet hair look, kohl eyes that compliment her look perfectly. In other pictures, she can be seen donning a strappy gold and black dress while in the other she looks gorgeous in the strapless silver mini dress. In the last picture, she is wearing a stunning purple and black sequin dress. 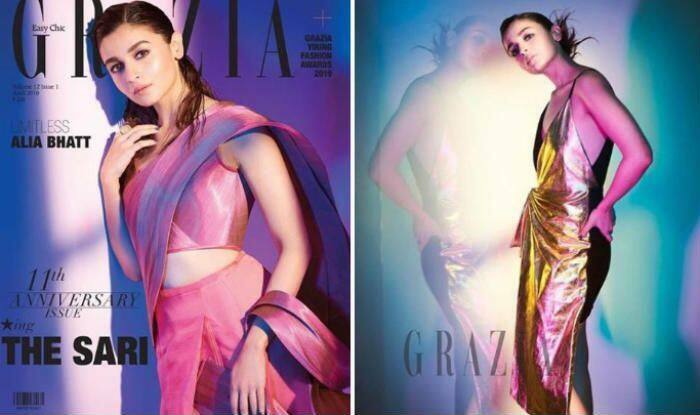 The pictures are shared by Grazia magazine’s official Instagram handle and Alia has also shared some of the pictures on her social media. Earlier, Alia and Ranbir Kapoor made headlines with their latest kissing video during Zee Cine Awards. In the viral video, Ranbir can be seen giving Alia congratulatory kiss on the cheeks but they almost touch the lips. The expressions on the couple’s face are hard to miss. Recently, her latest photoshoot with Varun Dhawan also took the internet by storm. While Alia can be seen donning a low neckline dress, Varun was bare-chested. With drenched and messy hair, both definitely raised the hotness bar. On the work front, Alia will be next seen in Karan Johar’s Kalank along with Varun Dhawan, Madhuri Dixit, Sonakshi Sinha, Sanjay Dutt and Sanjay Dutt. She will also be seen in Brahmastra opposite Ranbir Kapoor.